I have been called on a number of occasions a pro-US toady and an apologist for the actions of the US and UK governments, so I feel no compunction in saying that the US commentators and politicians - most notably the most senior Republican in the US Congress, Dennis Hastert - who are busily telling the Spanish they are cowards and appeasers, are stupid. In fact not just plain stupid, they are really stupid. And if they aren't stupid, they are both mendacious and malicious. How dare they? Cheap shots from the intellectually and emotionally stunted. "Rightwing American commentators charge Spanish voters with 'appeasement'. This is crass. More than three-quarters of the Spanish electorate turned out for a massive defence of democracy in the face of terror. 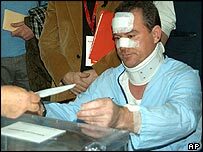 Every single Spanish voter was a soldier in the "war on terror". They voted different ways for all sorts of reasons. Historically, high turn-outs have favoured the left. Some of the former communist electorate voted tactically for the socialists. Many swing voters punished the conservative government of José María Aznar for initially attributing the attacks to the Basque terrorist organisation Eta. And, yes, some emotionally blamed him for having made Spain a more likely terrorist target by supporting Bush's war on Iraq. But to say that this vote adds up to 'appeasement' is a stupid slur." Tell me this man voting is a coward, Mr. Hastert.